Do you want those washboard abs? True, you won’t get abs of steel just by doing crunches and focusing all your time and effort just on your tummy area. However, pair this with eating right at least 80% of the time AND total body conditioning with cardio and “weight resistance”, and you will be seeing AMAZING results… and of course feeling awesome. 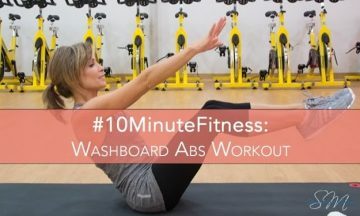 In this video, I wanted to show you how simple it really can be with another one of my #10MinuteFitness videos. Everyone can find 10 minutes to get on the road to better fitness and incredible abs. *Thanks to Retro Fitness for hosting us for this workout!! Be sure to check out all the other #10MinuteFitness videos and if you have any requests, I love to hear from you! Tag me at @ShannonMiller96 on Instagram and Twitter.